Looking for the perfect Christmas gift for your favorite Doctor Who fan? Do they love the Tenth Doctor, sonic screwdrivers, or Daleks? If you've overheard them arguing about the virtues of Rose over Martha, or what Bad Wolf really means, then these are the Christmas gift ideas you need. How cute is this? This little rotating Cyberman keychain is on sale for only $2.90! It's the perfect Christmas stocking stuffer gift for your Doctor Who fan. 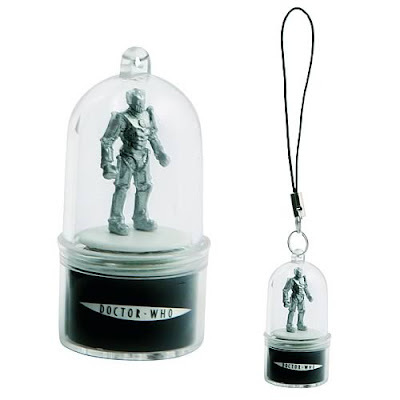 Click here to buy your Cyberman keychain for $2.90 from Entertainment Earth. Does your Doctor Who fan prefer David Tennant as the Tenth Doctor? Then they'll love a Christmas gift of this little Doctor action figure, complete with trademark pinstripe suit and sonic screwdriver. 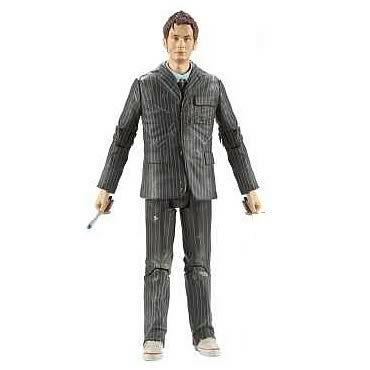 Click here to buy your Tenth Doctor action figure for $15.99 from Entertainment Earth. No Doctor Who fan feels complete without the Doctor's signature tool/weapon/gizmo, the sonic screwdriver. Get this--the sonic screwdriver replica lights up, has sound effects, and writes in invisible ink. It also comes with a wallet with "psychic paper." Totally the perfect sci-fi Christmas gift. 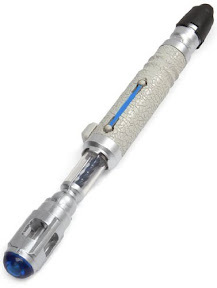 Click here to buy the Doctor Who sonic screwdriver gift for $19.99 from Amazon.com! Does your Doctor Who fan prefer the Eleventh Doctor? Gift them this Christmas with two little Matt Smith action figures--one in his raggedy Tenth Doctor clothes after he crash lands in Amelia Pond's yard, and one in his new genius professor duds of tweed jacket and bow tie. 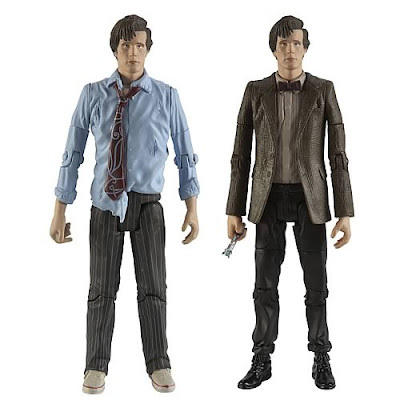 Click here to buy a double Doctor Who gift for $25.99 from Entertainment Earth. The diehard Doctor Who fan must have a Dalek in their Christmas stocking. Gift them with this striking Dalek wall clock, that illuminates when the room is dark. How cool is that? 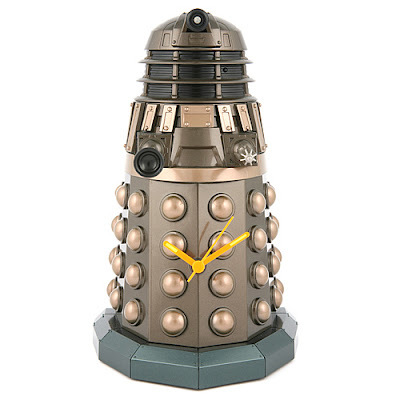 Click here to buy the Dalek wall clock gift for $25.99 from Entertainment Earth. Last, but certainly not least, we have the most beloved icon of Doctor Who fandom. This little blue box is the perfect Christmas gift for your favorite sci-fi geek; on TV it's a time traveling space ship--on your Doctor Who fan's desk it's a Tardis USB hub. 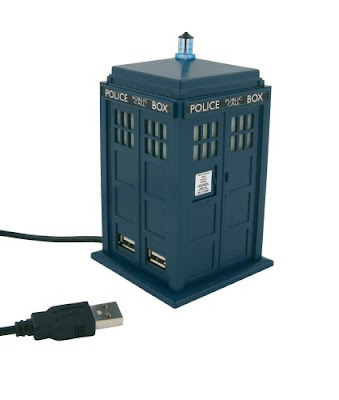 Click here to buy the Tardis USB hub for $35.99 from Amazon.com. Please enjoy these Doctor Who fan gift ideas. I have personally shopped with both Amazon and Entertainment Earth, and received quality products and good service. Thank you for shopping--your purchases help support this blog, at no extra cost to you! Mekhi Phifer to Star on "Torchwood"
Katie Couric to Guest Star on "Glee"